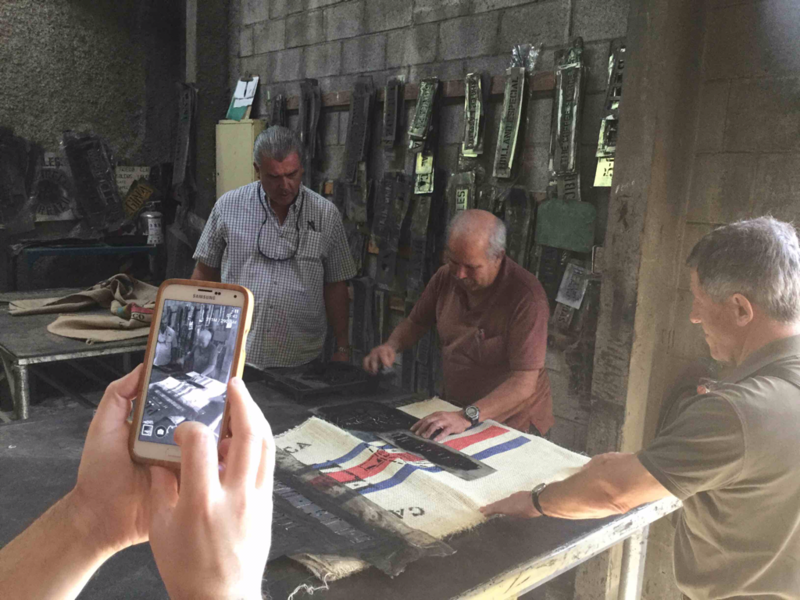 From January 11 - 18, I had the pleasure to enjoy another coffee field trip to Costa Rica! 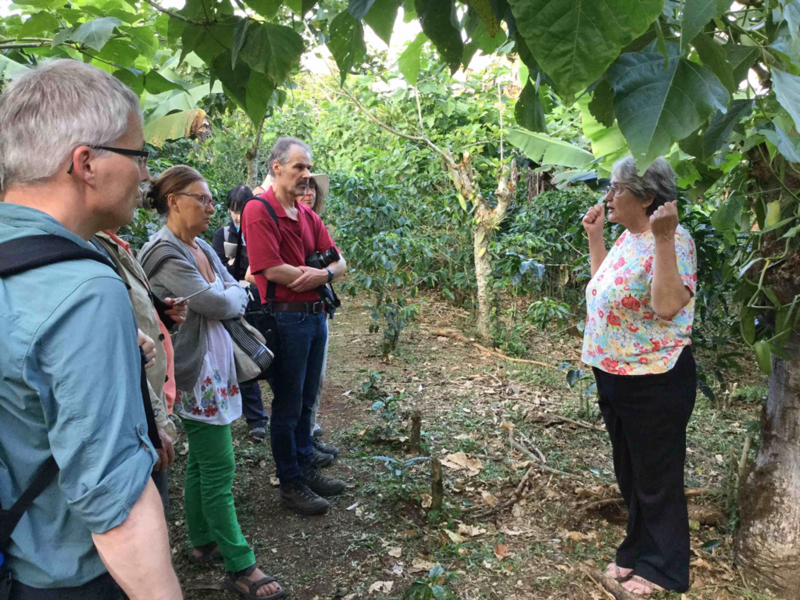 With the 10 of us we discovered, learned and enjoyed Costa Rican coffee culture, fantastic people, knowledge about coffee growing and processing. 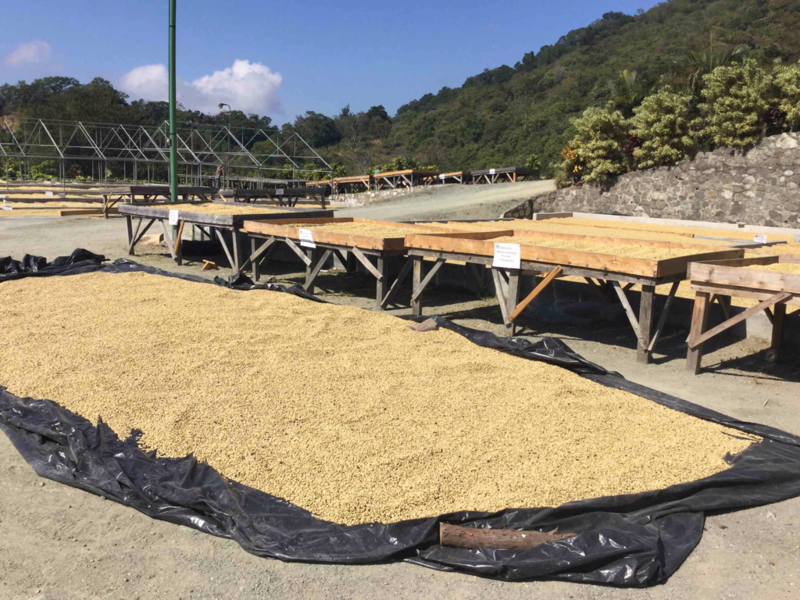 Again, Costa Rica coffee farmers are at the forefront of testing new ways of better processing their coffee in accordance with their high quality standards. The postings cover each day of the trip, every day another impression. ​The postings are in reverse order the oldest one at the bottom part of this page, scrolling down all entries. Enjoy reading! 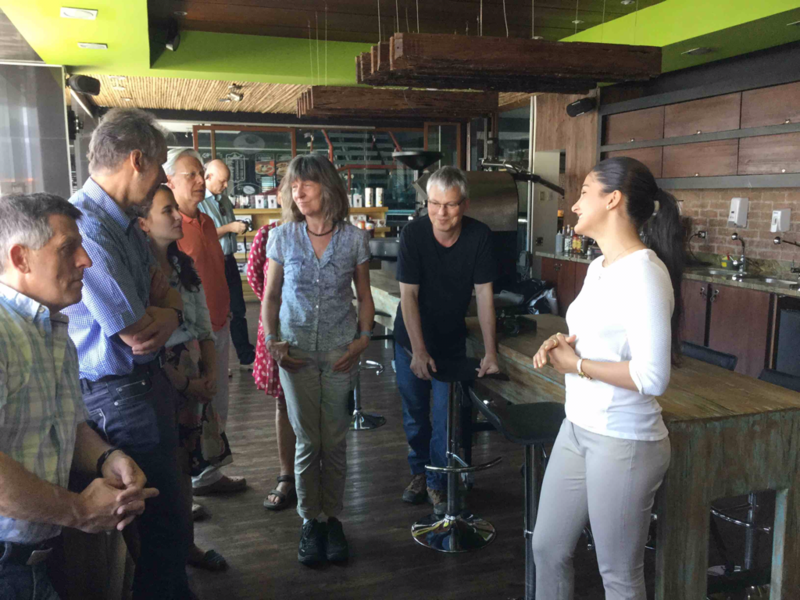 Great thanks to everyone we met during this exciting trip, to all participants and to the Coffee School of Hannover and the Association for Specialty Coffee of Costa Rica for making this happen! ​Vom 11.-18. 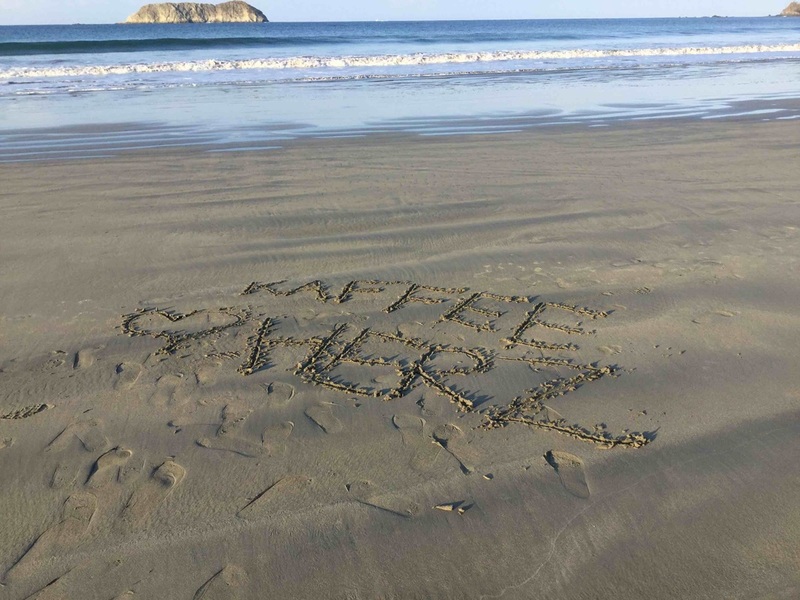 Januar fand unsere Kaffeereise in Costa Rica statt. Es war wunderbar wieder da zu sein! 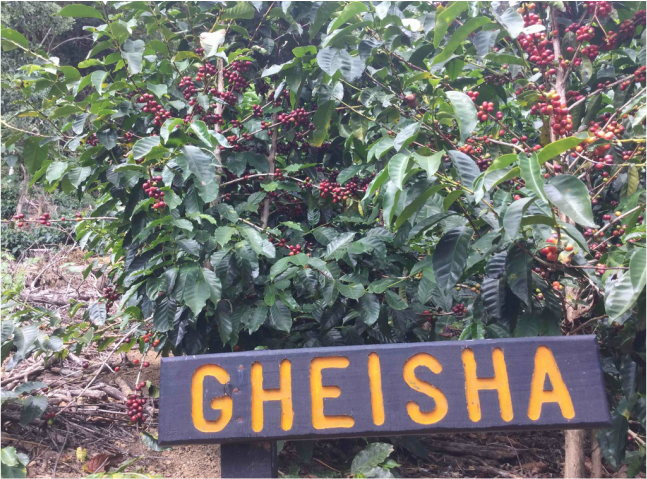 Mit 10 Teilnehmenden lernten und entdeckten wir die Kaffee-Kultur Costa Ricas sowie die Verarbeitung des Rohkaffees im Erzeugerland! Wie auch im vergangenen Jahr berichte ich von der Reise: Ältere Einträge befinden sich am Ende dieser Seite, Jüngere vom Ende des Trips gleich zu Beginn. ​Alle Einträge verfasste ich auf Englisch, damit noch mehr Menschen sich daran erfreuen können. Ich bin mir sicher, dass sie auch jede/r versteht, der die englische Sprache nicht täglich verwendet. Volcano Poas. The entry fee is US$15 and is definitely worth a visit! Lovely trails guide you through green and calm forests. As advised we came early on that saturday morning (arrival around 10 am) and queued only shortly in front of the entrance. When leaving the parking lots were full of big coaches and countless cars. The Pacific! Early in the morning the light is very good to get some nice shots. The region around Manuel Antonio provides a tropic climate with around 30 degrees temperature and approximately 87% humidity. Equip yourself with light clothing, and in the evening you may want to consider long and light pants and shirts - Moskitos may just love you too much otherwise ;) The water in the pacific is as warm as a bathtub: 28 degrees makes it a perfect way to take a long and relaxing bath. ​Tip: Treat yourself with good food at "El Avion", a historic aircraft. Tip: Provide yourself with long clothes, a light jacket and enough water! 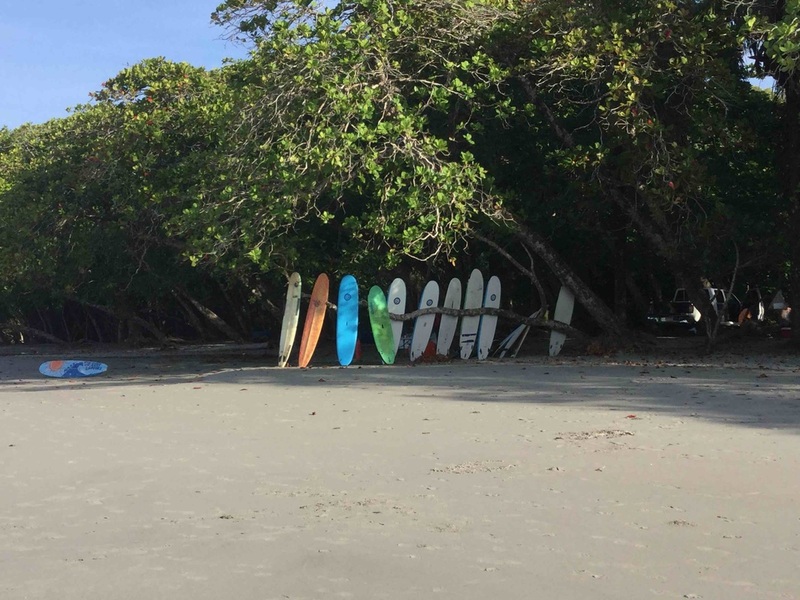 If you fancy to learn surfing you may feel comfortable; yet Manuel Antonio offers also the chance to visit another national park. So did we, and went there rather early on a tuesday morning (arrival around 11 am; walking distance from the hotel). The entrance fee is US$16. Although the queue to enter was incredible long we were lucky: Shortly after us they closed the entrance as at no point a certain amount of guests in the park shall not be exceeded. Tip: Provide yourself with enough water and a camera. Outside the park indulge yourself with a fresh opened coconut! Sunday. Today we are staying in San Jose. The Costa Rica coffee school welcomes us. 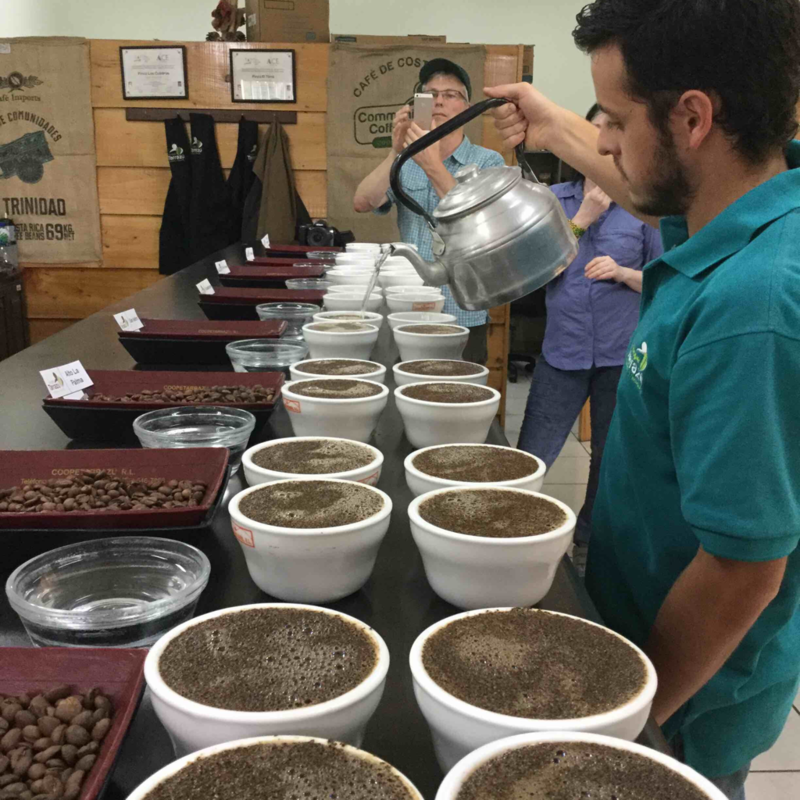 We have the pleasure to enjoy a cupping and get to know the roastery. 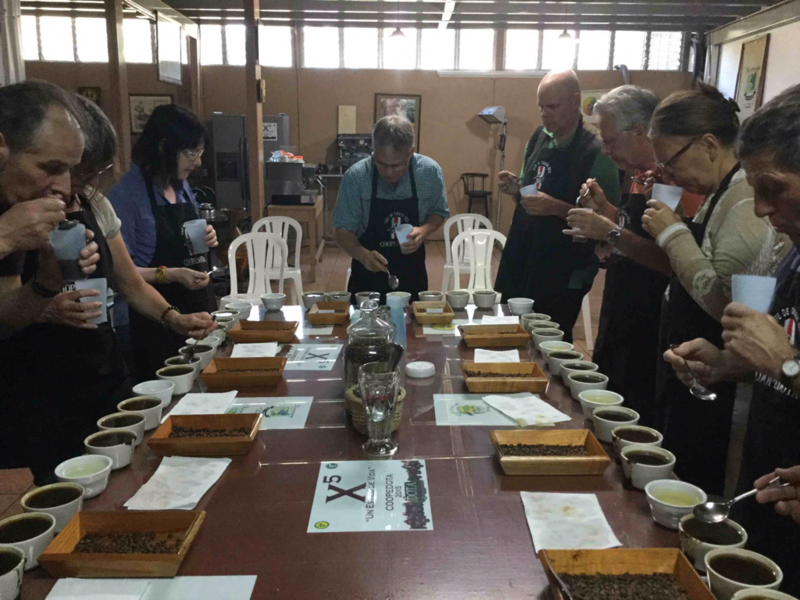 Afterwards we head towards the Café Kalu where we have a joint farewell lunch among the group and a representative of the SCACR, the Association for speciality coffee of Costa Rica. We are warmly welcomed on this sunday morning. The coffee school exists since 5 years and aims to train mainly the staff of "El Tostador" coffee shops. But also external people can participate! You can find the coffee shops all over Costa Rica and enjoy a nice cup of coffee! Cupping time! 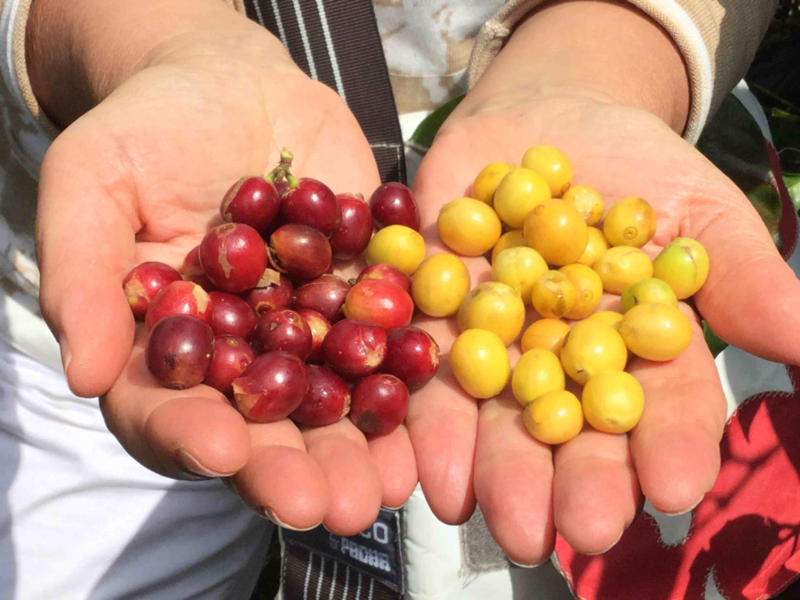 The last cupping in Costa Rica offers us the opportunity to cup two different Arabica-Varieties: A "Villa Sarchi", and the Ethiopian Variety ET34, that was imported to Costa Rica and is nowadays grown by approximately 9 farmers in Costa Rica. Great thanks for having us! It was a pleasure to learn! Saturday. On this sunny day we leave towards Rio Jorco, a micro-beneficio in the Tarrazú region. After a beautiful lunch at "Los Antojos de mi abuelo" with Rio Jorco owner Jim and Rio Jorco manager Ruudy and his fiancé, we are heading to Volcafé in San Diego. 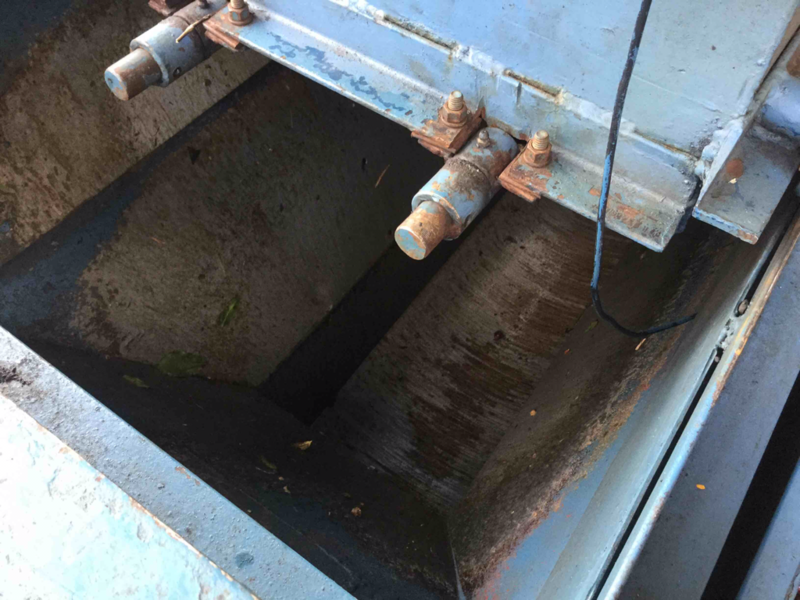 Rio Jorco micro-beneficio processes mainly microlots, more than 90 also this season. Partly own coffee, partly from farmers from the region. 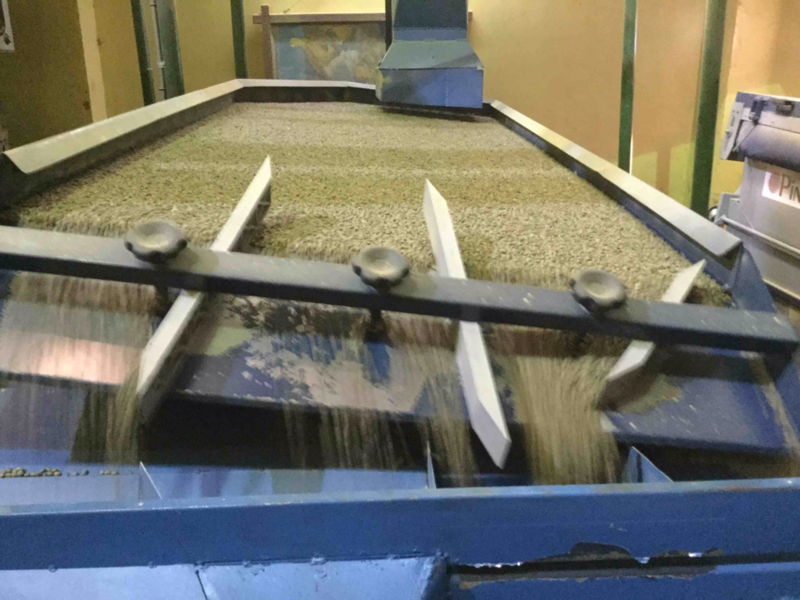 Rio Jorco itself produces approximately 1.000 bags of own coffee while farmers deliver coffee that equals approximately 4.000 bags of coffee. 4 containers of Rio Jorcos beautiful coffee are shipped to Europe, 6 are sent to the USA. In Europe, Rio Jorco sells to Belco in France. If you want to try Rio Jorcos coffee, pass by Camolini in Hannover for example or check their webshop. 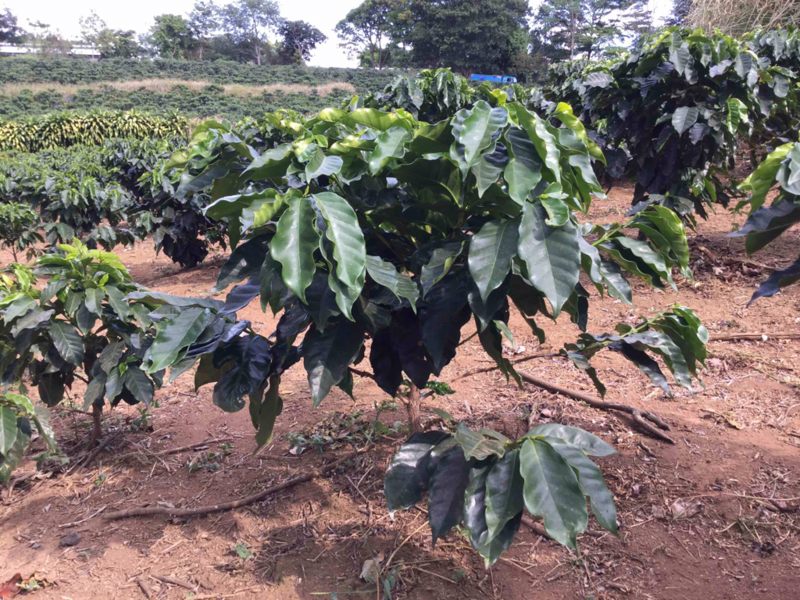 At Rio Jorco they grow the following arabica coffee varieties: Pacamara, Gheisha, Kenya, Caturra and Catuaí, Bourbon. See here a wonderful view from the farm! Simply beautiful to climb through this extraordinary farm! 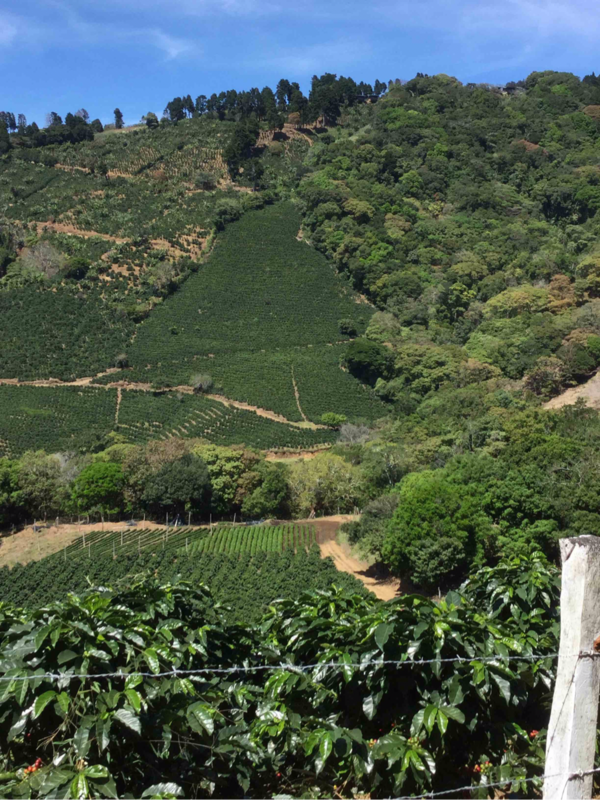 We take a tour through a nearby part of Rio Jorcos own coffee farm at an altitude of 1700 meters. We try pacamara coffee cherries and yellow bourbon. This plant looks like it grows red and yellow, yet, of course they grow on two separate bushes. Volcafé. Max is welcoming us and leads us through the mill. 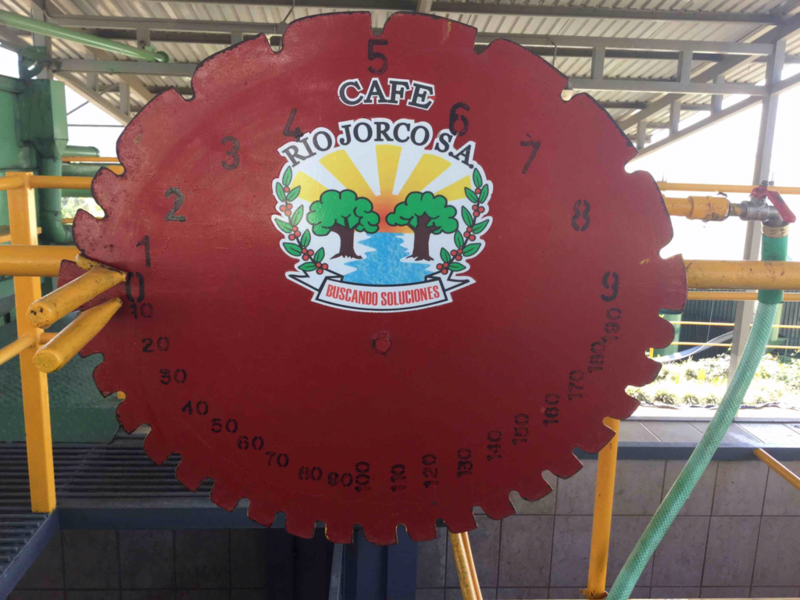 Volcafé holds 4 mills in Costa Rica. 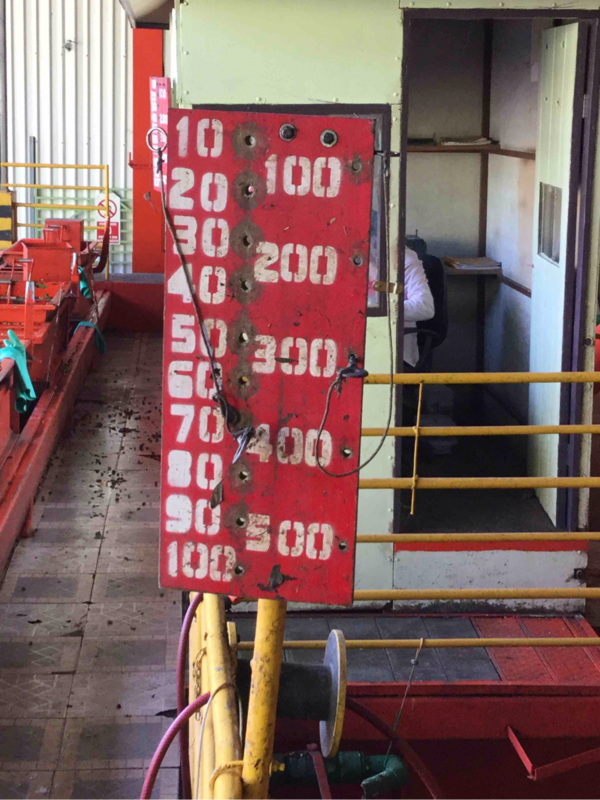 Additionally, they maintain 70 so-called receiving stations where farmers can deliver their coffee cherries in remote areas. Volcafé is thus an independant mill: Every farmer can choose it freely. 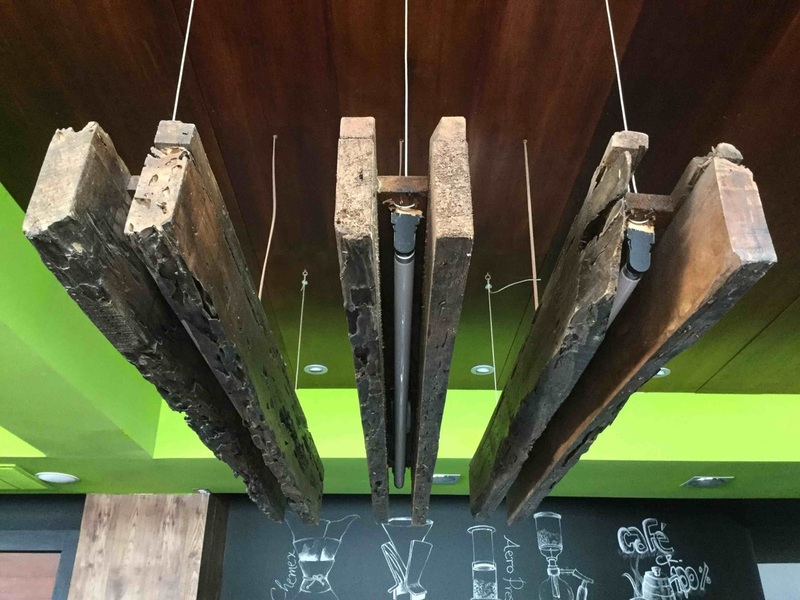 As mentioned in the sidestep-posting earlier, Volcafé does not use the measuring table anymore. 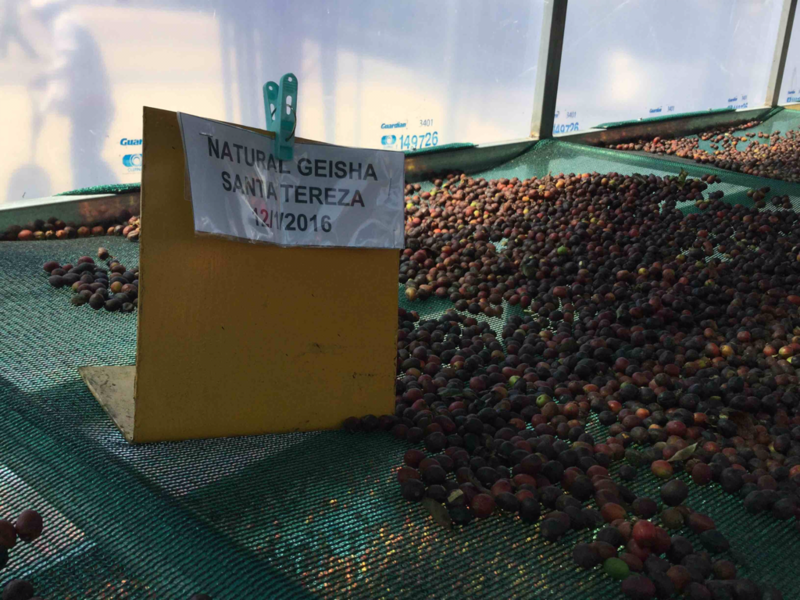 Instead, they weigh the incoming coffee cherries directly. This is a scale what you see here. After some first scepticism this system is now in place and perfectly working. 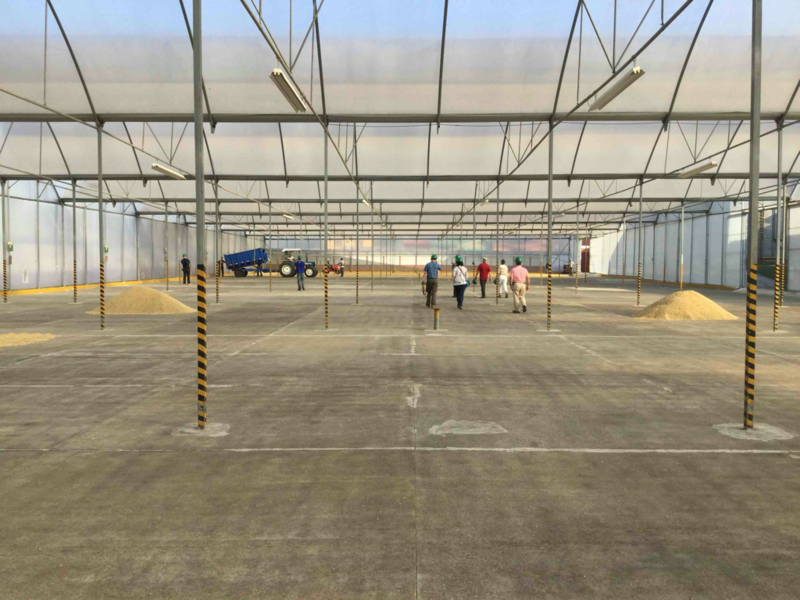 This drying space is quite big and filled with fresh honey-processesing coffee. 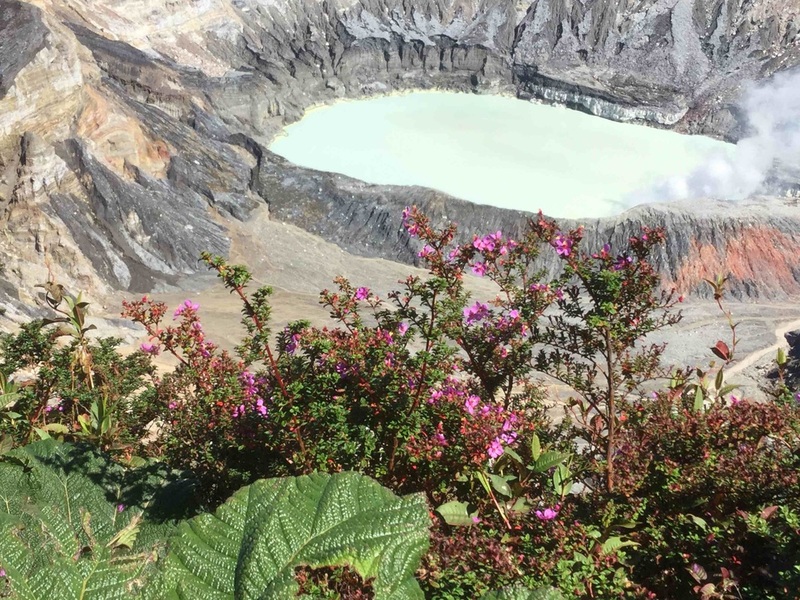 Volcafé is the 2nd largest mill in Costa Rica processing up to 170.000 fanegas per year. 25% of its coffee is sundried. Friday. We are leaving Chucaras Lodge very early to be on time at CoopeDota in Santa Maria in the Tarrazú region. In the afternoon we head accross the mountain to CoopeTarrazú. Upon arrival Mr Naranjo welcomes us warmly. He joins us later for the cupping session and his colleague Gaby is so kind to guide us through the beneficio. Also this year CoopeDota surprises me with another novelty in coffee processing as you can see here. Cupping time! We are happy to try coffees from the new season. Mr Naranjo joins us and speaks afterwards with us about the coffees. It was very good and intense cupping with a lot of valuable information about the different coffees. As a gift we received an apron each, so cool! Thanks a lot once more! In the afternoon we visit CoopeTarrazú. We are warmly welcomed with a presentation about the beneficio and delicious coffee and cake. 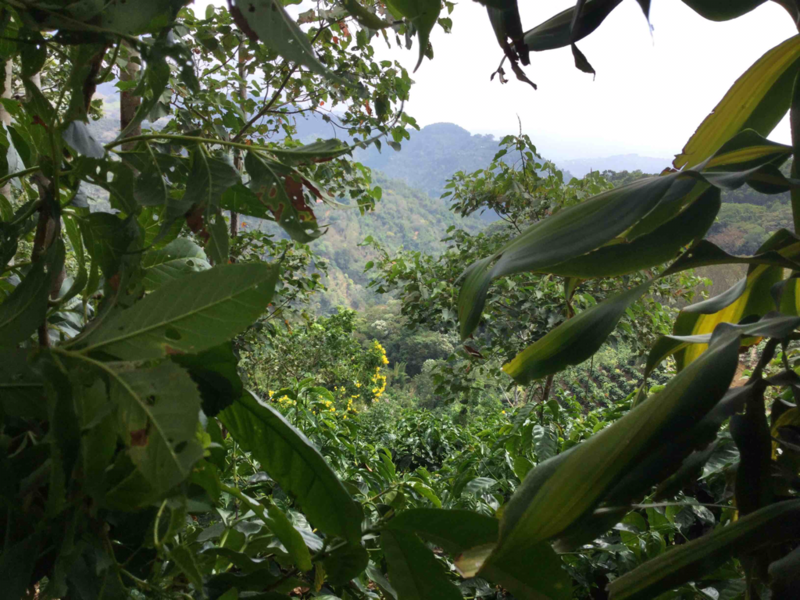 So, some figures: 94% of the coffee grows on an altitude of 1200 meters. 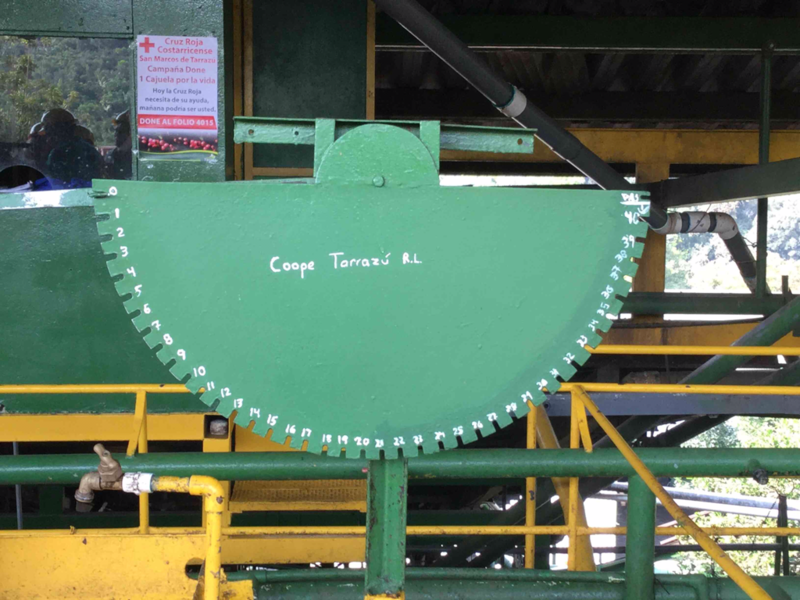 Per annum the beneficio processes up to 225.000 fanegas (highest harvest) and is thus the biggest processing mill in Costa Rica. CoopeTarrazú also maintains a supermarket, a gas station and other businesses. Approximately 80% of their members work on farms with a size of 4 hectares. 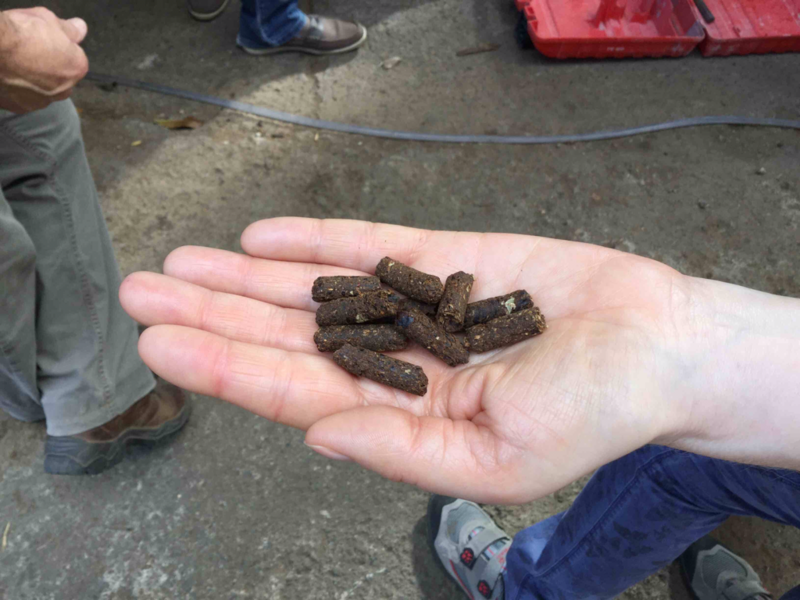 Since three years they are experimenting with microlots. 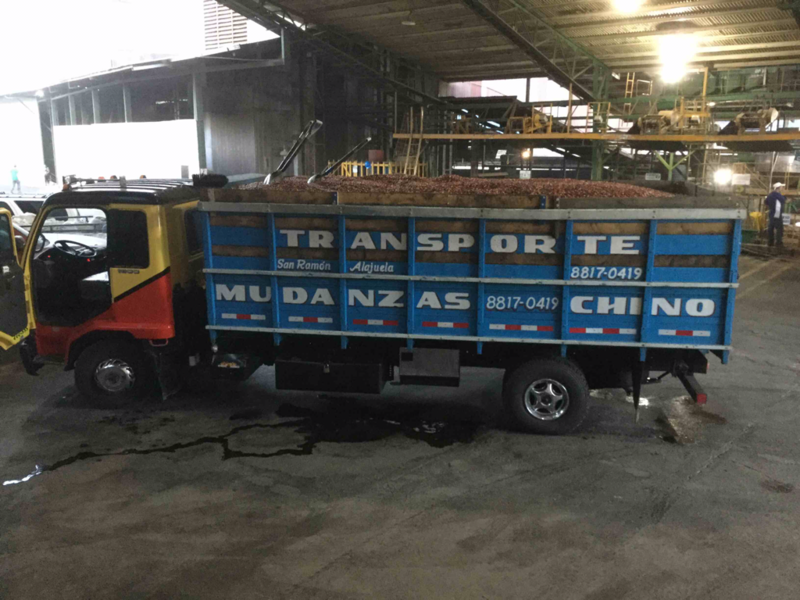 Currently these microlots deliver between 100 and 150 bags of coffee. 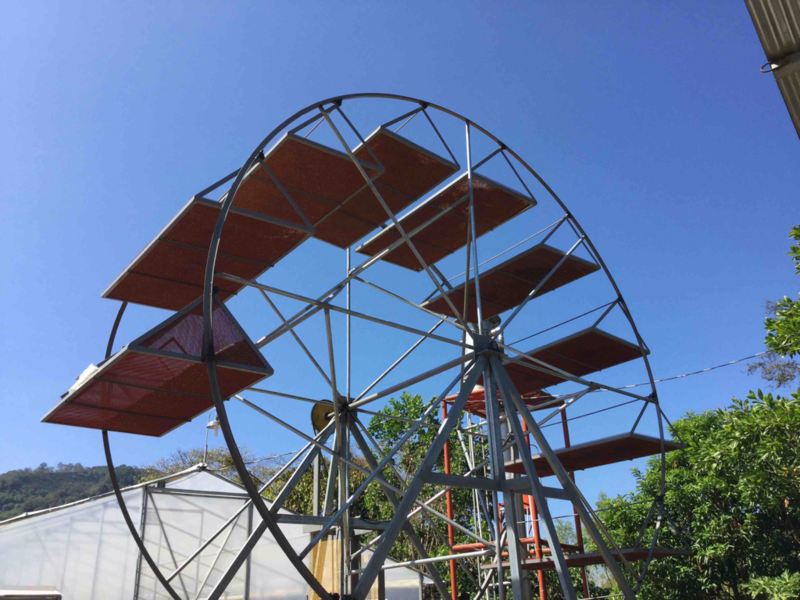 Take a closer look to this carousel that serves drying coffee cherries. The key question is whether the different climate conditions (sun, wind) affect the coffee flavour. Let's hope it has some good effects and we some delicious coffee to enjoy! New at CoopeDota are the african beds that are located in a sort of green house. They consists of three levels; we have seen two green houses in total. 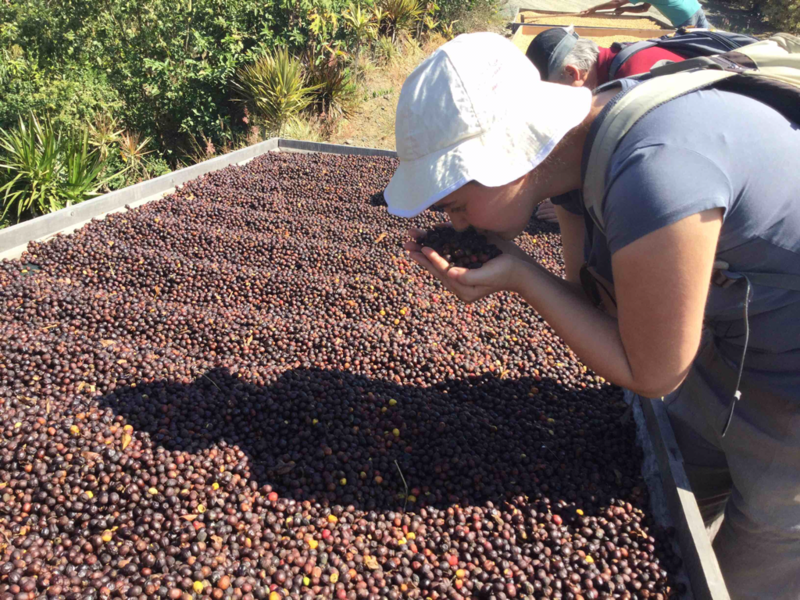 Gaby, who showed us around, compares it with a relaxing zone for coffee cherries: They relax on the beds and this relaxation effect we identify as delicious flavours in our coffee. Love it! It's cupping time! We are excited to taste the coffees and get an impression from the microlots as well! 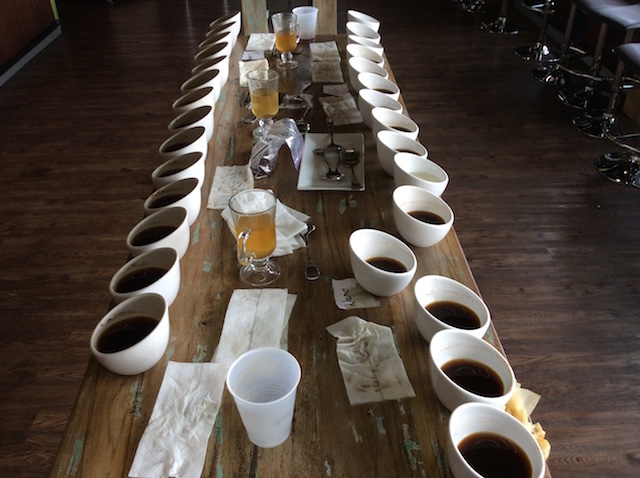 It was a very nice cupping and we learned a lot! It was nice to visit CoopeTarrazú again and see all developments! Thank you! 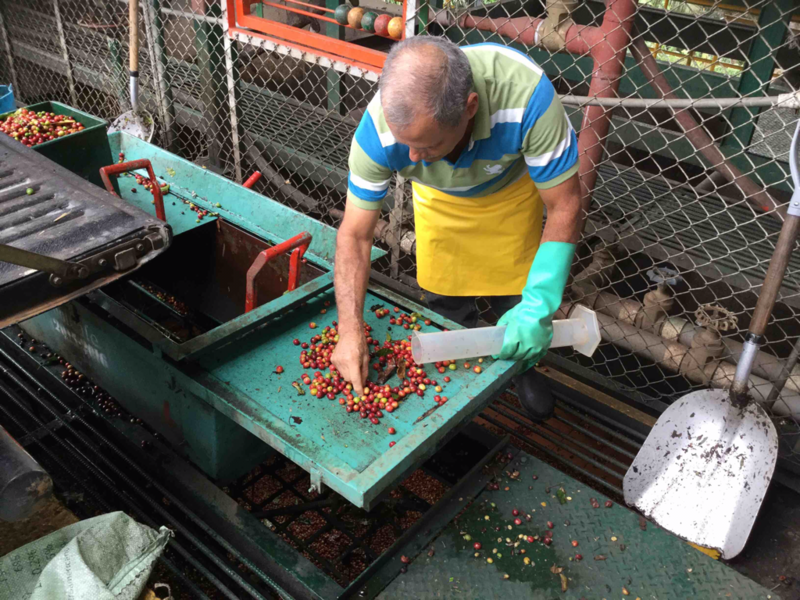 When a farmer delivers the coffee cherries to a mill, those coffee needs to be counted. Earlier I described that first measurement by volume is applied before it is transformed into weight. Arriving coffee cherries are loaded into fanegas: That are standardized green boxes. One fanega takes approximately 125kg (rough estimation!). There are different ways of counting them and here I would like to show you the variety of possibilities. 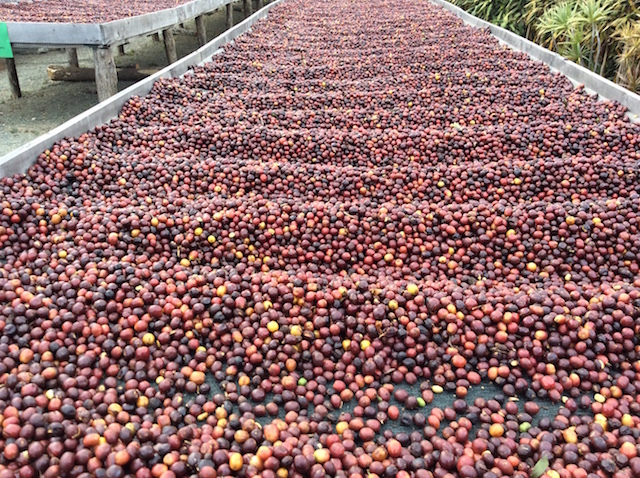 The way coffee cherries are counted at CoopeViktoria. 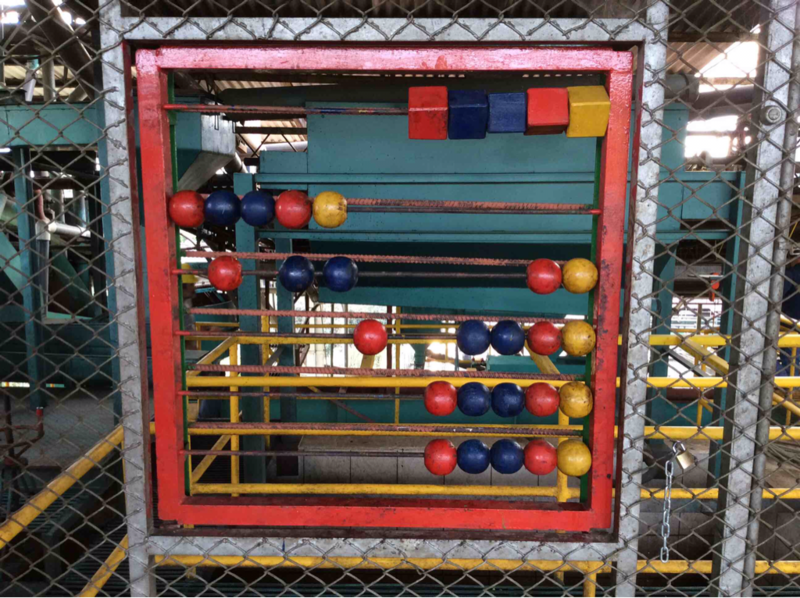 One coloured ball equals one full fanega. 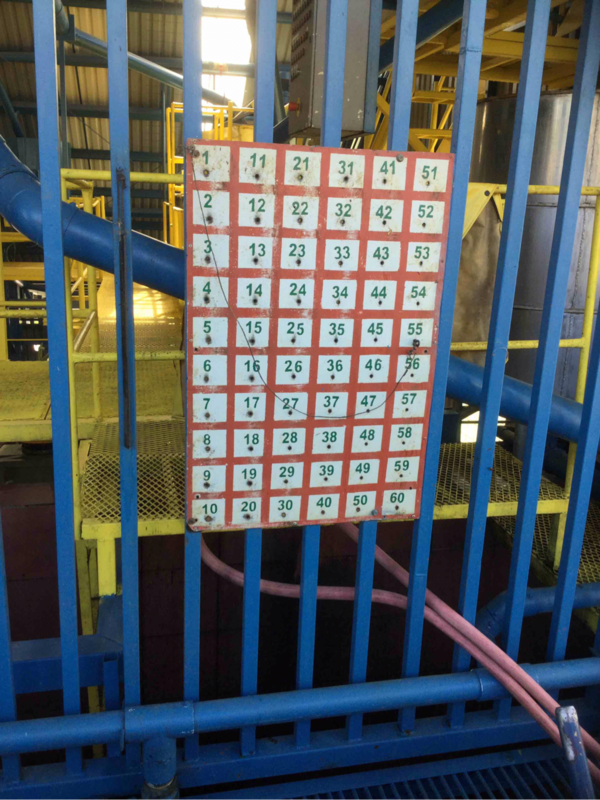 Micro-Beneficio Rio Jorco applies this system to count incoming coffee. At CoopeTarrazú we find this system. Equal to all systems is that it requires manpower. This one we find at CoopeDota. At Santa Anita we find this display. Thursday. We are in the beautiful region of Valle d'Orosi, south east of San Jose. Cecilia welcomes us at Finca Zalmari. She owns it together with her mother. She is a welcoming, open and caring person. Personally, I am still grateful for the way she cared about my severe cold, so much appreciated! Our free afternoon we spent at Finca Christina where Linda offers coffee tours to tourists before we continue to Chucaras SPA Lodge that we will own that night alone. Exciting! 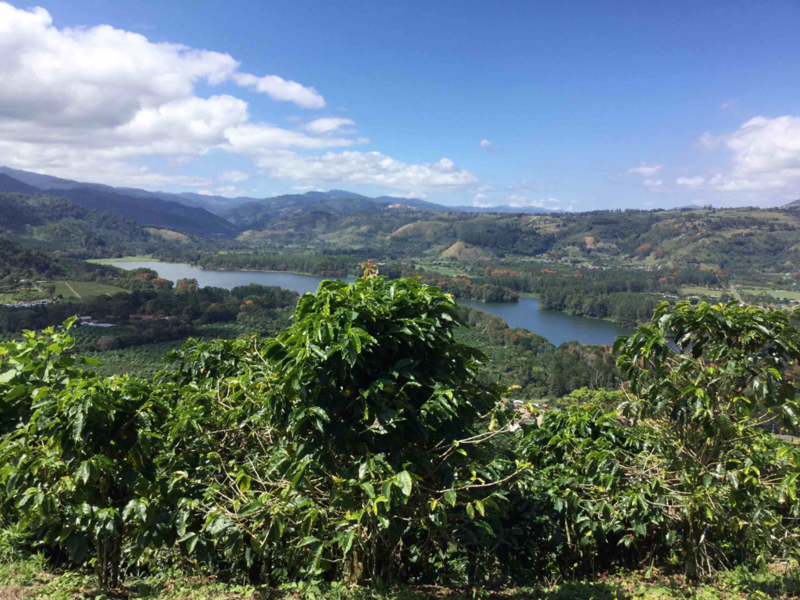 Finca Zalmari owns 100 hectar of coffee. 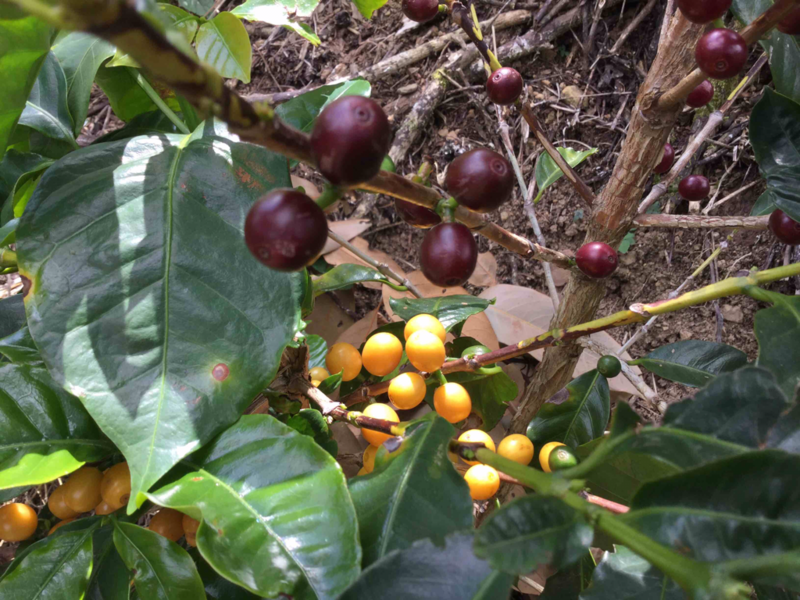 The main variety is Caturra and newly they also own Obatá, the new variety we've seen at CiCAFE the day before. Pickers from Nicaragua help during the harvest that is already finished when we visited the farm. 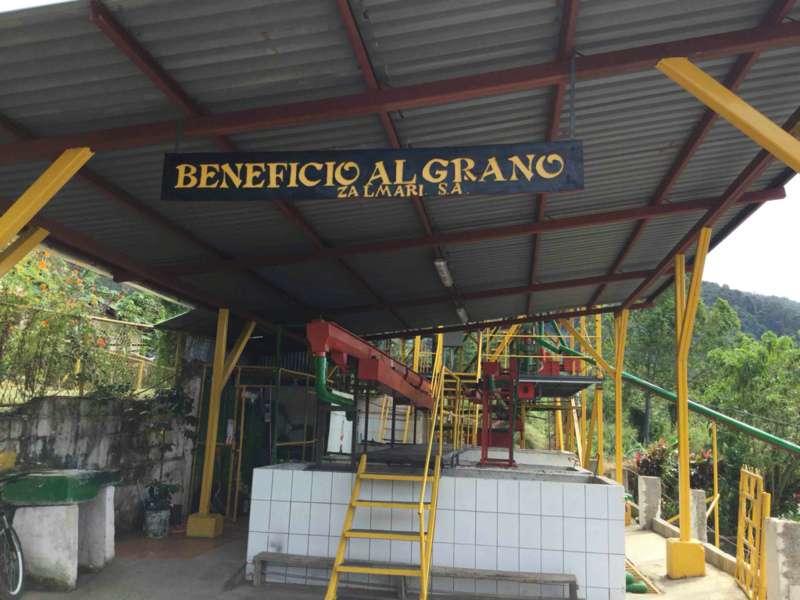 Just love the name of the beneficio: Al Grano. It refers to the heart of each coffee cherry, grano, in spanish, the whole bean. Also it means "to the point", a lovely and suitable expression for their precise and focused work! They follow the approach to work as environmentally friendly as possible. After a great tour through the farm, we enjoy a delicious dinner at Casona del Café. Cecilia gives us the figures of her farm: 3000 fanegas per year yield 110.000 kg of roasted coffee which equals 11 million cups of coffee. Zalmari in total consists of the farm, their restaurant and some lodges. The afternoon is casual time and we decided to pass by Finca Christina. That is on our way to our relaxation destination that evening, Chucaras SPA Lodge (offering hot springs and an awesome view on the Orosi Valley). Linda is leading us through her ecological farm: Here she and her husband grow coffee, roast it and sell it to tourists. On her farm she also cultivates bananas. She tells us about dependencies among soil, growth and yield. Basically her farm is like a lovely jungle and before leaving we enjoyed a delicious coffee together. Chucaras SPA Lodge including hot springs. After four days of intense coffee knowledge and meaningful learning experiences, we enjoyed a relaxing evening with nice food and warm hot springs water. A genius and peaceful place with a delightful taste of art and interior design. Not easy to find and everytime worth to return! Wednesday. Today we will learn about the coffee system and coffee research in Costa Rica. Both, Coricafé and CiCAFE, are very good stops for it. On a personal note, I am very happy about these stops and the expertise the people provide. At Coricafé we spent some happy hours with Eric, his father, managing director Stephan Wille and his father as well. Coricafé has genuinely german roots, thus the connection between the group and the owners was established easily. 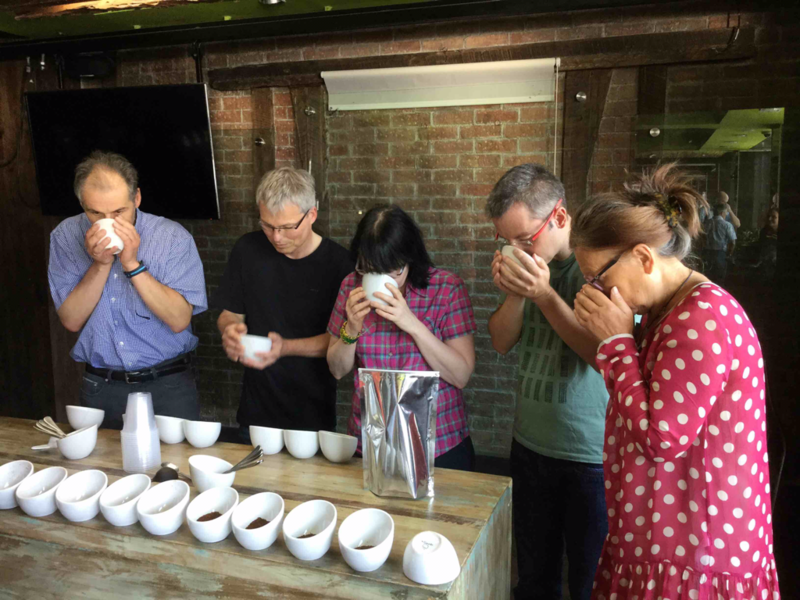 Great thanks to their valuable time and the delicious cupping! 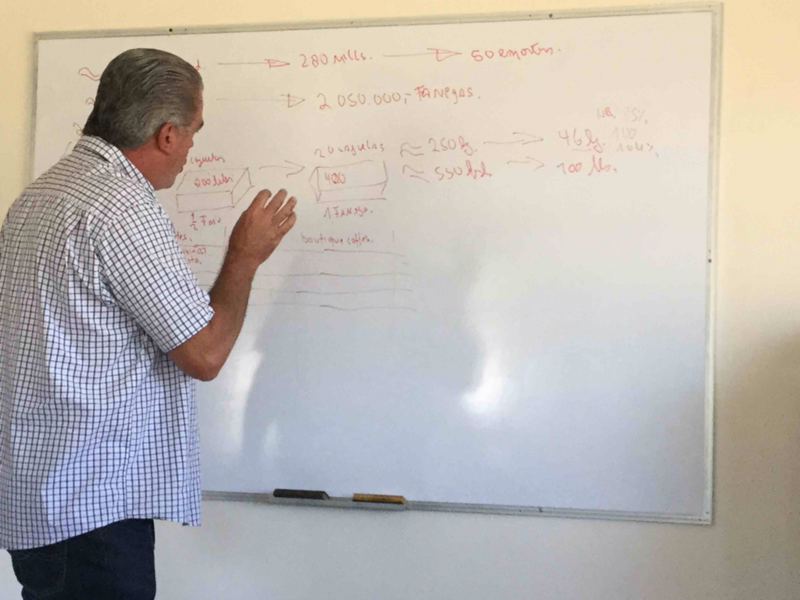 Eric, the boss, explains the coffee regulatory system in Costa Rica. It is about cajuelas, fanegas and quintals. The coffee system firstly measures in volume and transfers it later into weight. 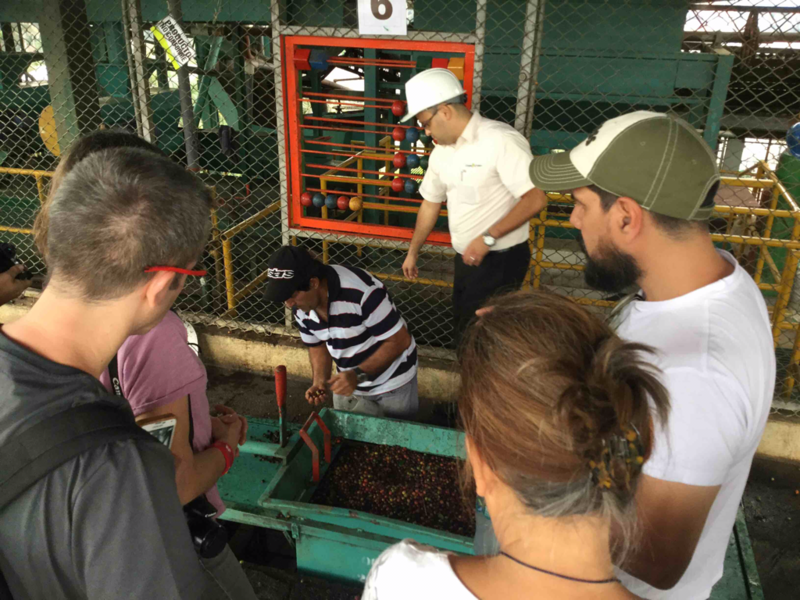 Overall the system focuses on quality and equal access to the coffee market. This system selects coffee beans by colour. The picture shows a snapshot of 3 channels; in total at Coricafé we find one room full with many more of these machines. 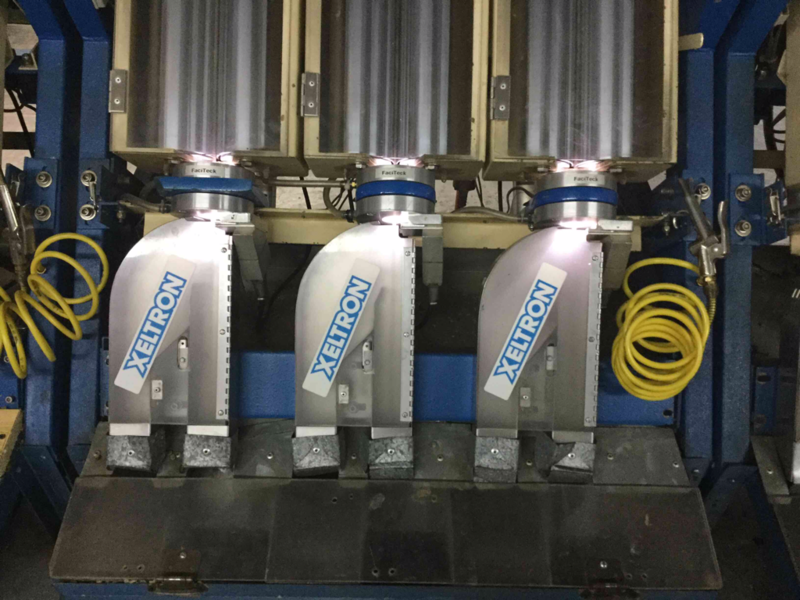 Each channel processes 69 kg/hour. An airstream kicks out the not desired coffee beans. By the way, these machines are incredible noisy. Eric takes out a sample of the channel: The beans on the left hand (the one in front) are sorted out. The beans on the right hand (here the one in the back) are the ones that are desired. If you wish you take a closer look and see whether you identify different colours. How is a coffee bag prepared? This gentleman prepares a special bag right on the spot just for a member of our group! It was great to witness such a process, truly hand-crafted. So much appreciated! 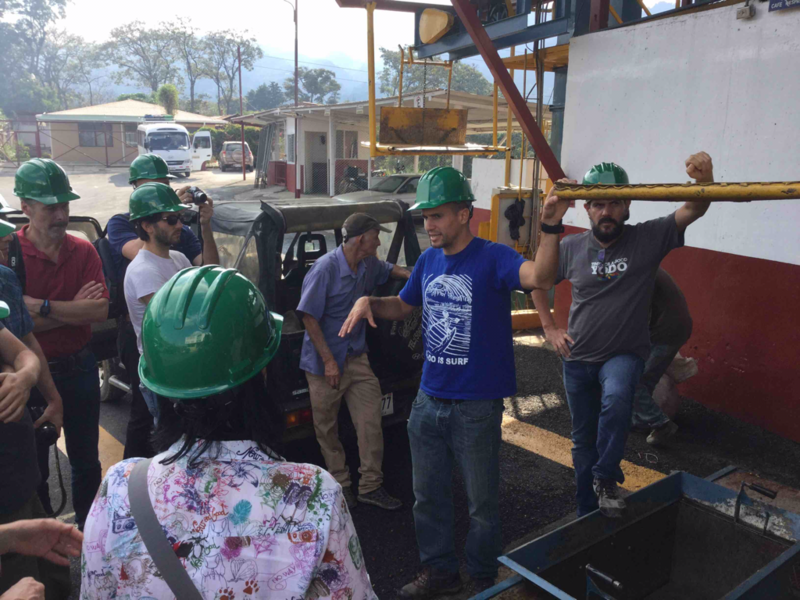 At CiCAFE we are happy to get an insight into coffee research and the coffee system in Costa Rica. 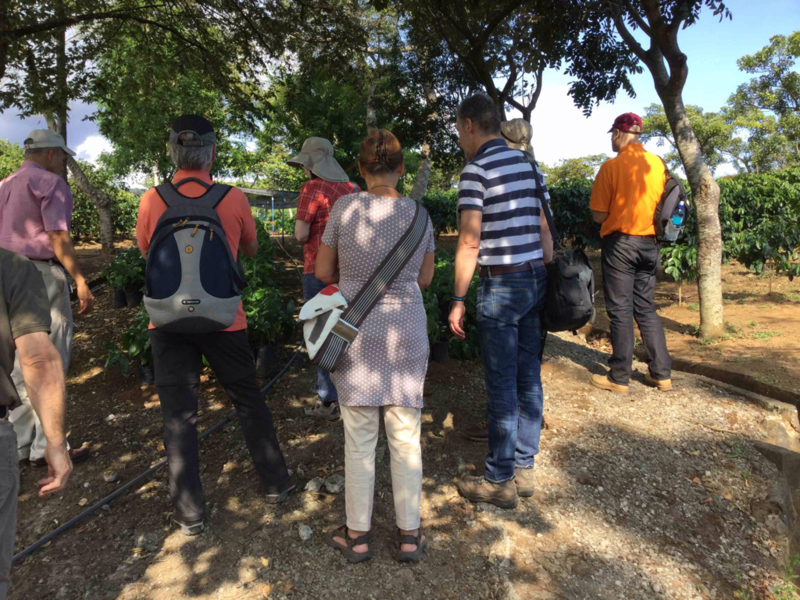 We are warmly welcomed with a tour accross the research facilities, the plants and a very good and intense cupping session. Personally, i was very glad to meet so many known faces again! Thanks a lot for having us! Arrival at CiCAFE. 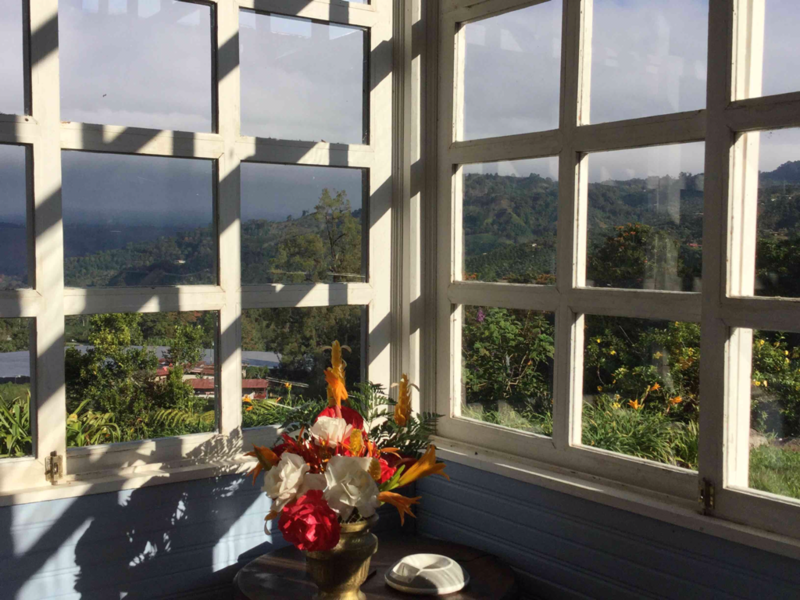 This is the Costa Rican institute for coffee and coffee research. Among others they focus on soil improvement and research on varieties and processing methods. Attachached to the institute we find a huge plantation. One current project is this: A gasifier. 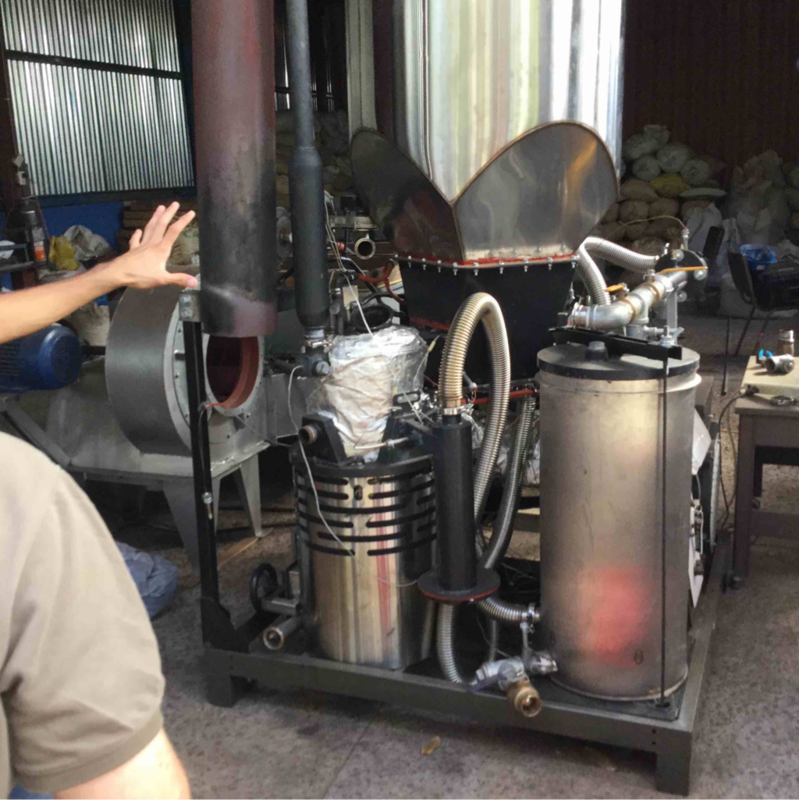 This prototype aims to transfer leftovers of the coffee production (e.g. pulp) into energy. Electricity turnout yields 18 kw/hour! The key idea is to reduce emissions related to coffee production. And yes, it will be possible to purchase it, once testing turns out successfully. This is a new variety called Catigua. It is aproximately three years old and comes originally from Brasil. 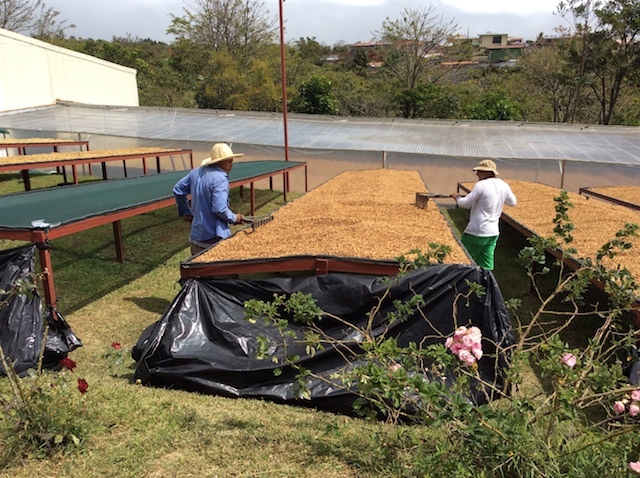 Tests were successfully and one result is that the yield is almost twice as much as from Caturra or Catuaí. When exploring new varieties the following three criteria are of major importance: Flavour, resistance to diseases, yield results. This is coffee! To be precise, coffee pallets. That is coffee pulp turned into dry, small and light coffee pieces. 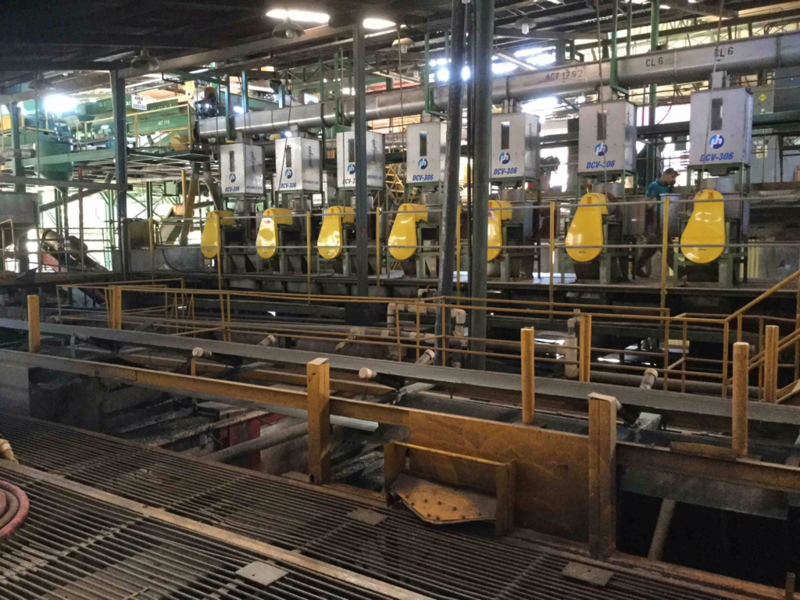 A special machine produces 200 - 300 of these pallets per hour. 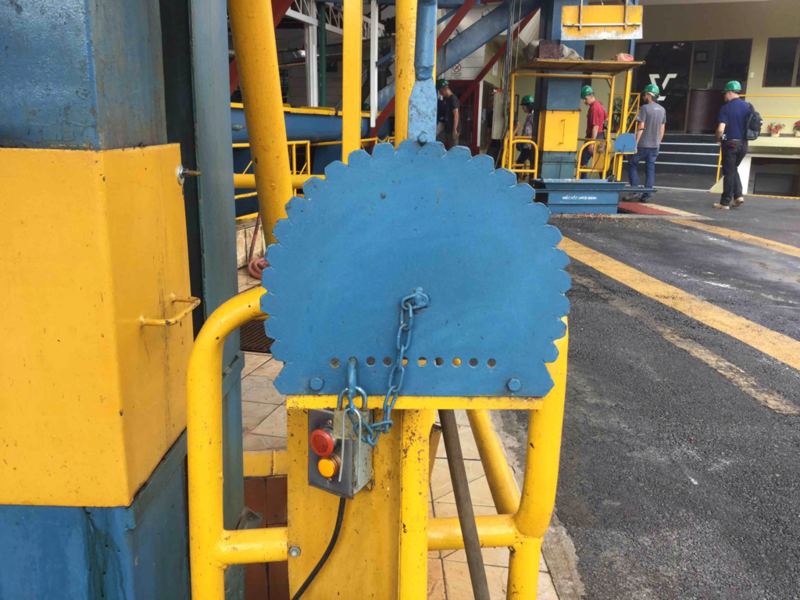 They are the burning material for the gasifier. The goal of this and the gasifier is to provide solutions for carbon neutral Costa yrica by 2022. Tuesday. First stop of the day leads us to the Beneficio Santa Anita. 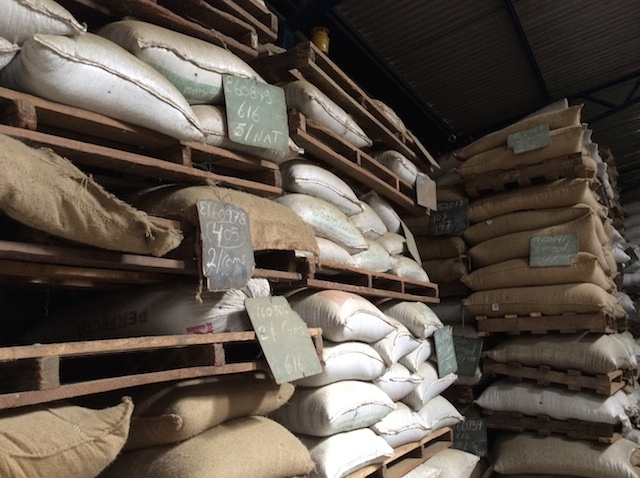 They build on a long coffee tradition and 60% of the processed coffee is their own. 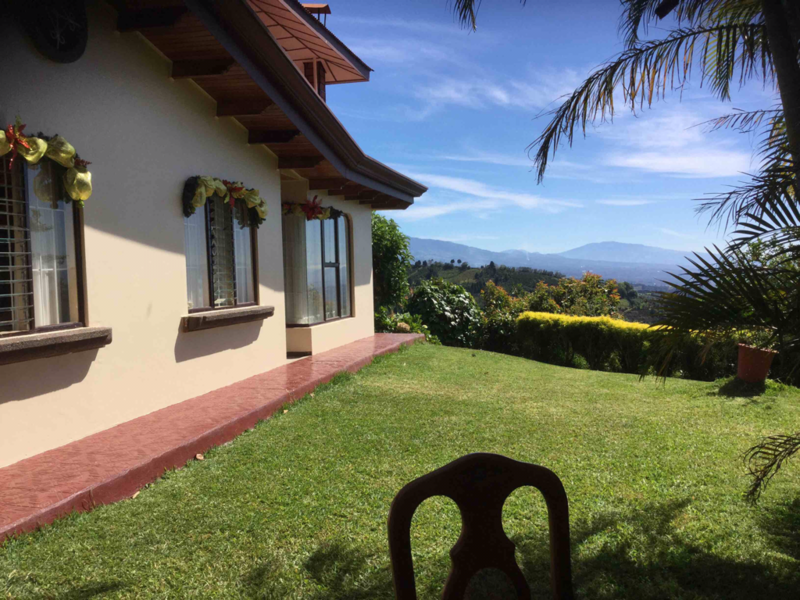 The farm is located in the West Valley region with an altitude of 1300 meters. 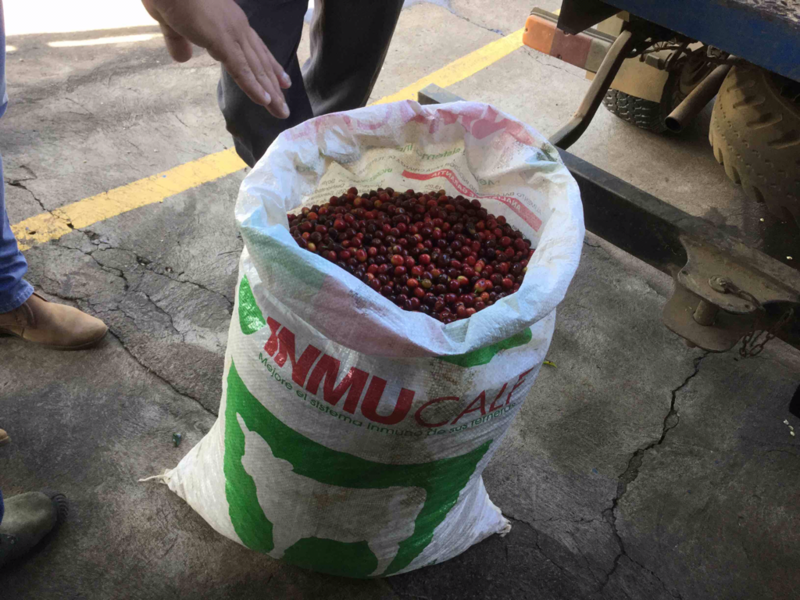 A fresh delivery of nice, sweet and ripe coffee cherries arrive. 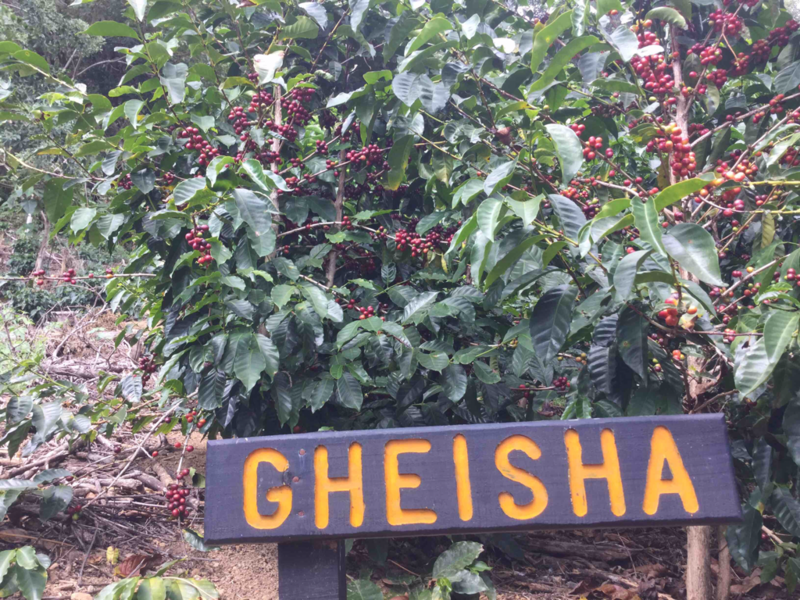 This is a variety called Geisha. It tastes sweet and the size of the cherries is quiet big. At Santa Anita they grow also Caturra, Villa Sarchi and Catuaí. 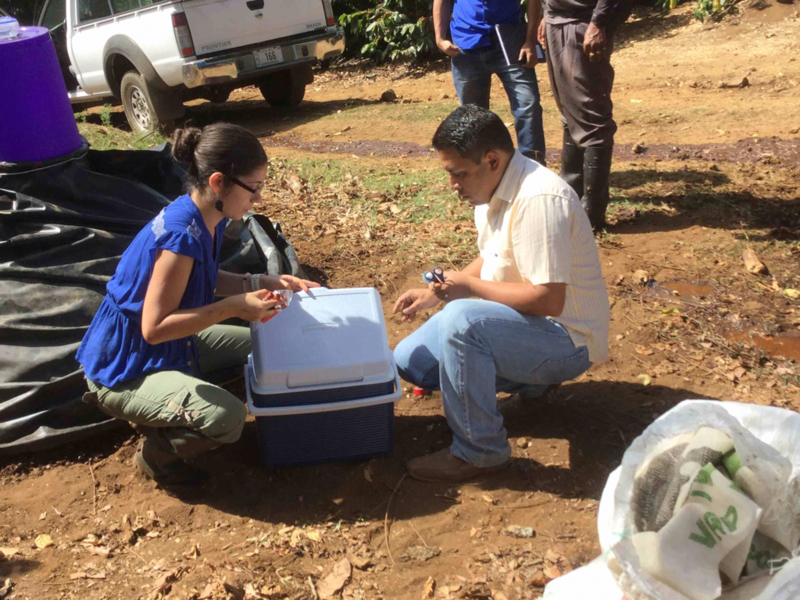 Here they take a testing sample for defining the CO2 emissions in the coffee pulp. This regular check is part of a Zero-Emission Certificate that the beneficio wants to qualify for. Our harvest! Doesn't it look delicious? With the 10 of us we went into the farm and did our best to pick quickly and only the ripe ones: The darker the better. Well, we as Europeans will never reach the picking speed of a professional picker. Yet it is a great learning experience to see what it takes for just one cup of good coffee! In the afternoon we are pleased to visit CoopeViktoria. This cooperative is a big and traditional one in Costa Rica. During harvest, 2000 - 3000 Fanegas (green basket in the middle of the picture) arrive at the mill. Processing takes place in the evening hours and at night, starting at around 6 pm. That is to reduce energy costs. 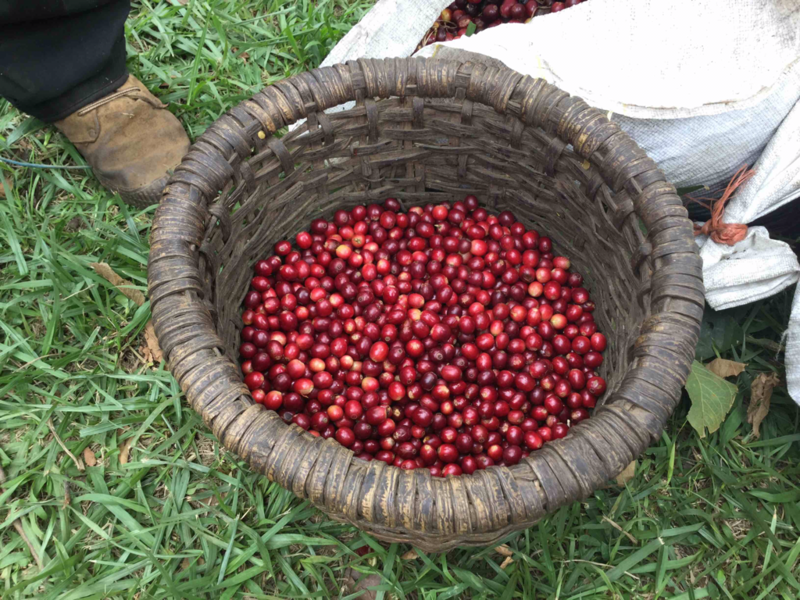 Directly when a farmer delivers the coffee cherries, quality control takes place. One liter of coffee cherries is taken from the delivery randomly. At maximum an amount of 2% green cherries are allowed. In addition a maximum amount of 5% so-called floaters (basically coffee cherries that are too light and thus not full developed) is allowed. Farmers are directly informed about their results. In case they exceed these figures, they are advised to pay more attention to their harvest. Monday morning 7:30. 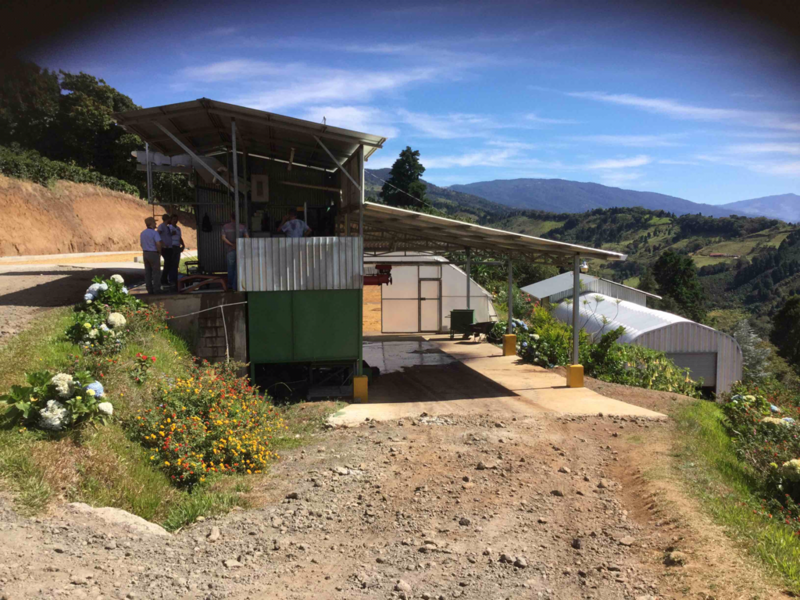 We start our coffee tour visiting the Micro mill of Vista al Valle in the West Valley Region of Costa Rica. Owner Gerardo is proud of his 4 hektares size Finca that is family owned ever since. He, his wife and all three sons gave us a warm welcome and great insights into their daily work. 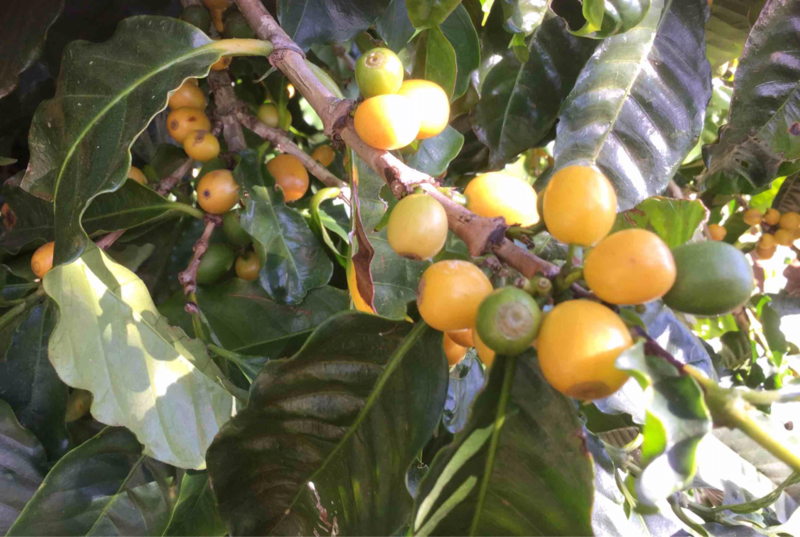 On those 4 hectares we find yellow and red catuai arabica varieties. I tried one of this plant and find it sweet and tasty. Also we find on his farm bananas and a great variation of different trees. 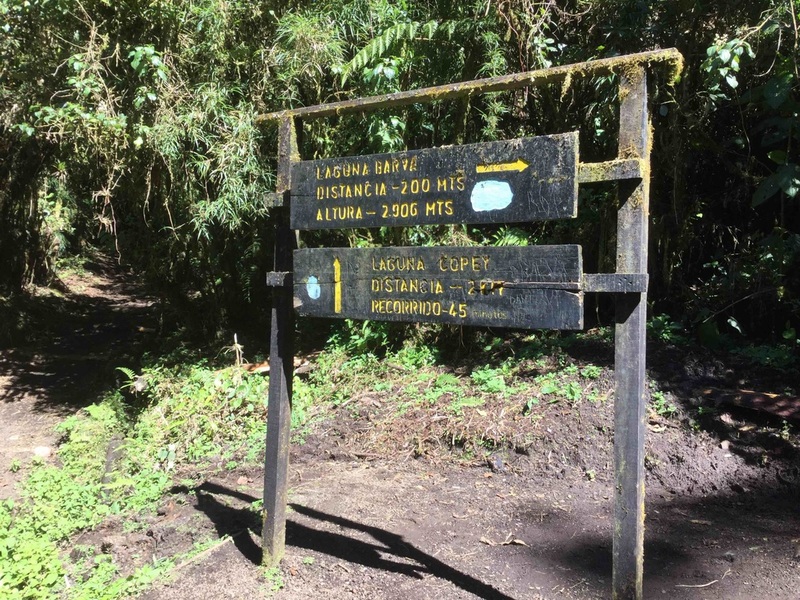 The beneficio is located at 1500-1600 metres above sea level. The mill produces 600 fanegas per year. One fanega equals approximately 23 kg. The mill takes part in the Cup of Excellence competition for the last three years: Very successful as they won the Costa Rican one in 2013! This is the winning lot of the 2013 winning Cup of Excellence participation. This year Gerardo will give this lot into an annual coffee competition again. Good luck! Café de Altura de San Ramon is the 5th largest mill in Costa Rica. Manager Alfonso Campos welcomes us and presents the cooperative. The annual production counts 100.000 fanegas. 90% of this harvest is already sold, for example to Illy. 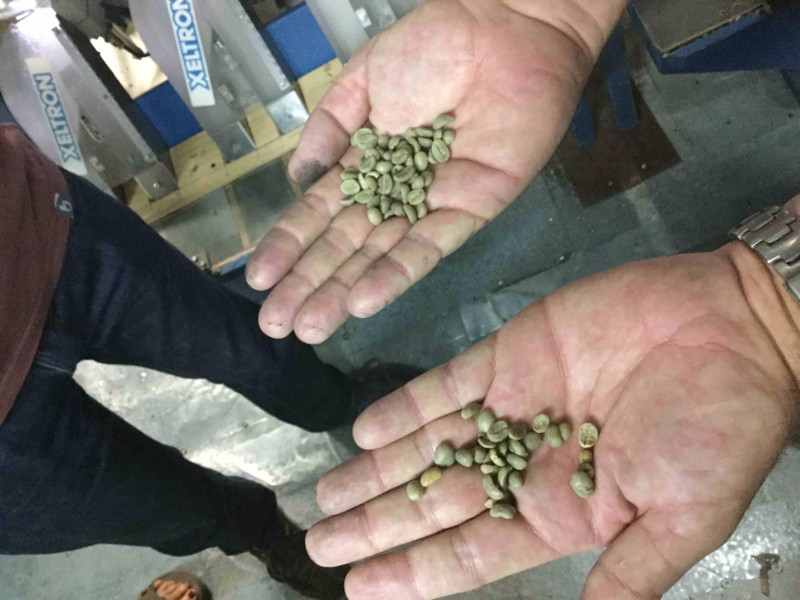 Two hands with green coffee. 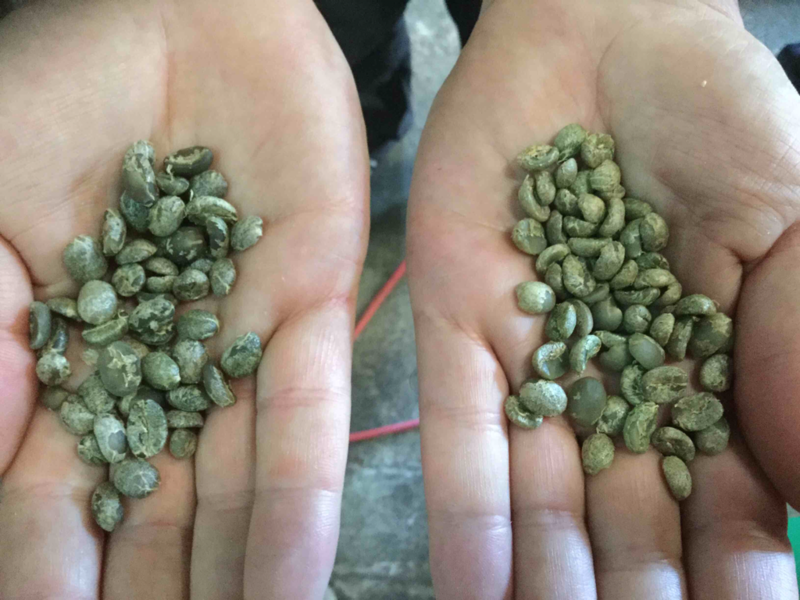 Left we see green coffee containing approximately 18% humidity while the right hand green coffee contains 11% humidity. The cooperative fosters its engagement into the anaerobic fermentation process. 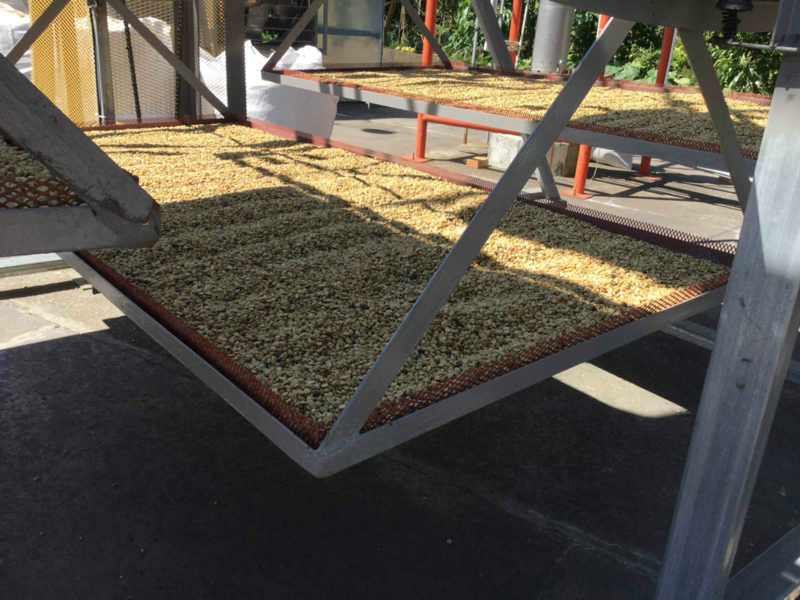 This is a rather new process where fermentation takes place without air and through adding additional mucilage to the coffee cherries. Für unsere geplante Ursprungsreise nach Costa Rica, können wir noch zwei freie Plätze anbieten. Von den insgesamt 12 vorhandenen Plätzen sind noch zwei verfügbar, die von mutigen und kurzentschlossenen Interessenten gefüllt werden dürfen. 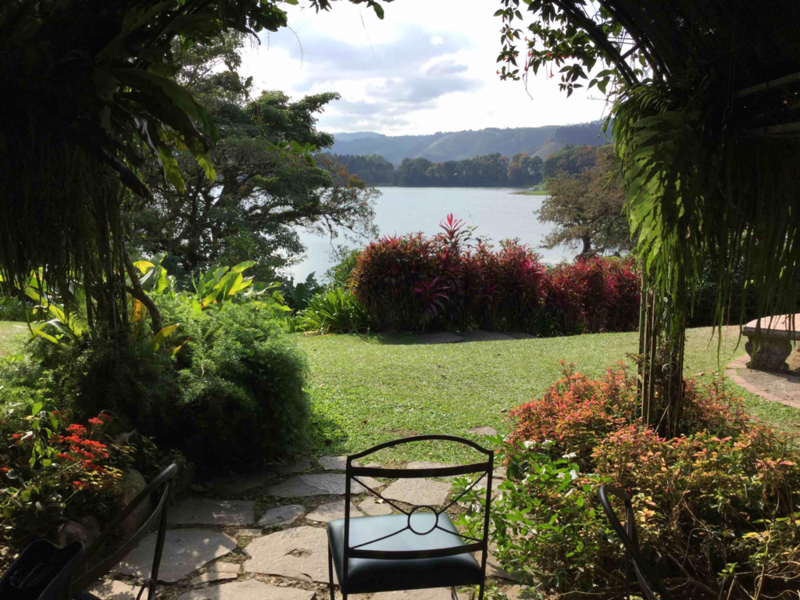 An- und Abreise individuell, geführte Tour durch die SCACR (Speciality Coffee Association de Costa Rica) vom 10. bis 18.01.16, Übernachtung und Frühstück und einige Snacks auf den Plantagen, sowie der Transport vor Ort im eigenen Reisebus, sind im Reisepreis enthalten. Ebenso der Tourguide von der SCACR. Unterbringung in guten Mittelklassehotels, eine Übernachtung in der exklusiven Chucaras Lodge im Orosi Tal. Vorher und hinterher besteht die Möglichkeit eines Individualprogramms. Kosten pro Person: 1.700 $ (USD = je nach Wechselkurs 1.500 bis 1.600 €, ohne Flug). Bei Interesse muss die Buchung sehr kurzfristig, bis zum 16.12.15 erfolgen.